Sabratha was a Phoenician trading-post that served as a coastal outlet for the products of the African hinterland. Besides its magnificent late 3rd century theatre, that retains its three-storey architectural backdrop, Sabratha has temples dedicated to Liber Pater, Serapis and Isis. 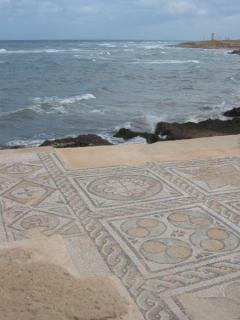 There is a Christian basilica of the time of Justinian and remnants also of some of the mosaic floors that enriched elite dwellings of Roman north Africa (for example, at the Villa Sileen, near Al-Khoms), although these are most clearly preserved in the coloured patterns of the seaward (or Forum) baths, directly overlooking the shore, and in the black and white floors of the Theatre baths. In 1964, while stationed in Brindisi, Italy (USAF Physician). I had TDY in Wheelus and visited Sabratha. Pictures are on my website ( www.billmccabe.com ) on the links to pBase and Webshots. Fascinating trip, I wish I had had more advance information, I could have made more definitive pictures. The deep blues and greens of the Mediterranean and clear blue sky create a breathtaking backdrop for this awesome ancient Roman site. I couldn't help but spread my arms wide for applause as I stood on the theatre stage, and lounge on the steps of the classic Roman bath. Even the marble latrines lured me to take a seat and imagine what life there may have been like. For about $2, I explored, touched, and experienced a past that I had only read about in a History book. I have been to Sabratha twice, and plan to visit again for the wonderful way my mind opens up to the past with wonder and imagination. Sabratha is not as large as the Leptis Magna site about 3 hours drive to the east, but definately worth seeing. Each site is unique and beautiful, so I recommend taking time to visit both, preferably Sabratha first as it will take your breath away, then allow Leptis Magna to take your breath yet again when you discover the immense size of the preserved city. when I was ten years old, my father was stationed at Wheelus Air Force Base, our family visited the ruins. My sisters and I, were down by the ocean, and I found lying on the ground, a wrapped paper object, with three coins inside. Two coins were smaller ones, about the size of a dime, with nothing on them. The larger one, was made from brass, with a roman emperor, roman numerals, and perhaps the name of "claudius" on the front. Also on the back, is a standing lady, holding a quiver of arrows, (the goddess "Athena"? ), and it's about the size of a silver dollar, and three times as thick. 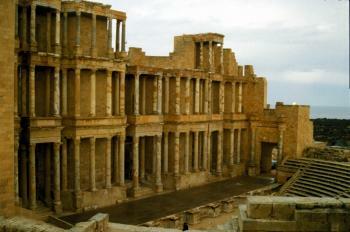 The main glory of Sabratha lies in its well preserved Roman theatre (photo). The site as a whole is not as extensive or fine as that of Leptis Magna and if you are not really into Roman ruins you might even question whether it is worth it. While you are in the region, however, you might as well persevere with these 2 sites, together with the Museum of Tripoli which contains many fine mosaics removed from them (those left in situ are often deteriorating rapidly). Sabratha is pleasantly situated close to the sea. Unfortunately the weather was not so good when we were there – it does rain in Libya! Also it was Ramadan so perhaps we were a bit lacking in sustenance needed to generate real enthusiasm as we walked around unfed - on the journey back to Tripoli we joined the “Ramadan Rush hour” with everyone speeding to get back home before the muezzins announced that it was time to eat and we could join them! Simultaneously with the four other World Heritage sites of Libya "because of damage caused by the conflict affecting the country and the threat of further damage it poses". Under control of ISIS: Since Dec 10, 2015. They have been ousted by "a combination of US airstrikes and attacks by local forces" in February/March 2016.